On the verso, in ink: a handwritten French inscription (probably nineteenth century), mentions the philosopher Democritus. Intently interested in the expression of human emotion, Rembrandt often used himself as his own model in his early years as an independent master in Leiden. Here, in a small and freely painted work, he appears in the guise of a soldier, relaxed and engaging the viewer with a laugh. For this sophisticated self-portrait, painted at age twenty-one or twenty-two, Rembrandt combines a study of character and emotion (known in Dutch as a tronie) with a rare jovial self-presentation. The lively, short brushwork in the face and brisk handling of the neutral background convey a sense of spontaneity and immediacy. This is one of a small number of paintings by Rembrandt from the late 1620s executed on copper. He signed it in the upper-left corner with his monogram of interlocking letters, "RHL" (Rembrandt Harmenszoon Leidensis), which he used only briefly, from late 1627 to early 1629. Hazlitt, Gooden & Fox, Ltd. (London, England), sold to the J. Paul Getty Museum, 2013. Moes, E. W. Iconographia Batava: Beredeneerde lijst van geschilderde en gebeeldhouwde portretten van Noord-Nederlanders in vorige eeuwen. 2 vols. (Amsterdam: Frederick Muller & Co., 1897-1905), vol. 2 (1905), p. 310, no. 6693.6. Hofstede de Groot, Cornelis. Beschreibendes und kritisches Verzeichnis der Werke der hervorragendsten holländischen Maler des XVII. Jahrhunderts. 10 vols. (Esslingen a.N: Paul Neff, 1907-28), vol. 6 (1915), p. 257, no. 601a. Bauch, Kurt. Rembrandt Gemälde (Berlin: Walter de Gruyter & Co., 1966), pp. 30-31, no. A25, ill.
Chapman, H. Perry. Rembrandt's Self-Portraits: A Study in Seventeenth-Century Identity (Princeton: Princeton University Press, 1990), p. 38, fig. 42 (as lost). van de Wetering, Ernst. "'Rembrandt Laughing,' c. 1628 - a painting resurfaces." Kroniek van het Rembrandthuis (2007), pp. 18-40, ill.
Wetering, Ernst van de. Rembrandt: A Life in 180 Paintings (Amsterdam: Local World, 2008), p. 42, ill.
Wetering, Ernst van de. Rembrandt: The Painter at Work. Rev. ed. (Amsterdam: Amsterdam University Press, 2009), frontispiece ill.
Wetering, Ernst van de. Nouveau regard sur Rembrandt (Amsterdam: Local World BV, 2009), pp. cv-xviii, pls. V16, V21. Wetering, Ernst van de. A Corpus of Rembrant Paintings. Murray Pearson, ed. and trans. 5 vols. (Dordrecht: Springer, 1982-2011), vol. 5 (2011), pp. 156-57, 162, 659, addenda to vols. 1-4 (side A), ill.
Chapman, H. Perry. 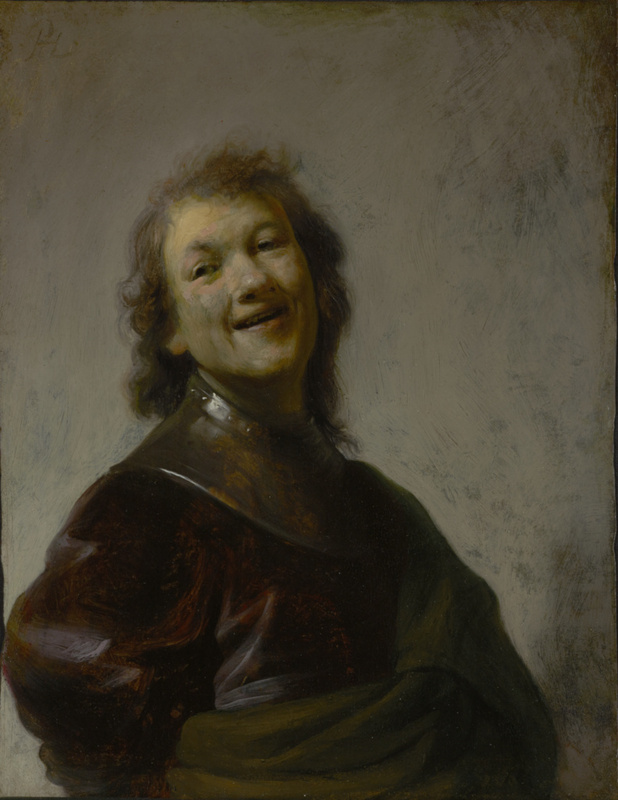 "Rembrandt's Laughter and the Love of Art." In Midwestern Arcadia: Essays in Honor of Alison Kettering (Northfield, MN: Carleton College, 2014), passim, fig. 2, https://apps.carleton.edu/kettering/chapman/ (accessed July 9, 2014). Weller, Dennis P. "The Closer You Are, the More You See." In Small Treasures: Rembrandt, Vermeer, Hals and Their Contemporaries, exh. cat. Dennis P. Weller, ed. (Raleigh: North Carolina Museum of Art, 2014), p. 17, fig. 19. Quodbach, Esmée, ed. Holland's Golden Age in America. Collecting Art of Rembrandt, Vermeer, and Hals, exh. cat. (New York: The Frick Collection, 2015), p. xviii, ill.
Woollett, Anne T. "Golden Opportunities: Collecting Rembrandt in Southern California." In Holland's Golden Age in America: Collecting the Art of Rembrandt, Vermeer, and Hals, exh. cat. Esmée Quodbach, ed. (New York: The Frick Collection, 2015), pp. 168-181. White, Christopher. "The Rembrant Research Project and its denouement." The Burlington Magazine 157, no. 1343 (Feburary, 2015), p. 73. Wetering, Ernst van de, and Carin van Nes. A Corpus of Rembrandt Paintings: Rembrandt's Paintings Revisited - A Complete Survey. Murray Pearson, ed. and trans. 6 vols. (Dordrecht: Springer, 1982-2015), vol. 6 (2015), pp. 56, 69, 84, 481-82, 487, 490, 496, 527, no. 18, ill.
O'Neill, Francis and Sofia Palazzo Corner. "Rembrandt's self-portraits." Journal of Optics 18 (2016), http://iopscience.iop.org/article/10.1088/2040-8978/18/8/080401 (accessed July 15, 2016), pp. 3, 6, 7, fig. 4. Schnackenburg, Bernhard. Jan Lievens: Friend and Rival of the Young Rembrandt, with a Catalogue Raisonné of his Early Leiden Work 1623-1632. Kristin Lohse Belkin, trans. (Petersberg: Michael Imhoff Verlag and the author, 2016), pp. 76, 143, ill.
Schnackenburg, Bernhard. Jan Lievens: Freund und Rivale des Jungen Rembrandt, mit einem Kritischen Katalog des Leidener Frühwerks 1623-1632 (Petersberg: Michael Imhoff Verlag and the author, 2016), pp. 76, 143, ill.